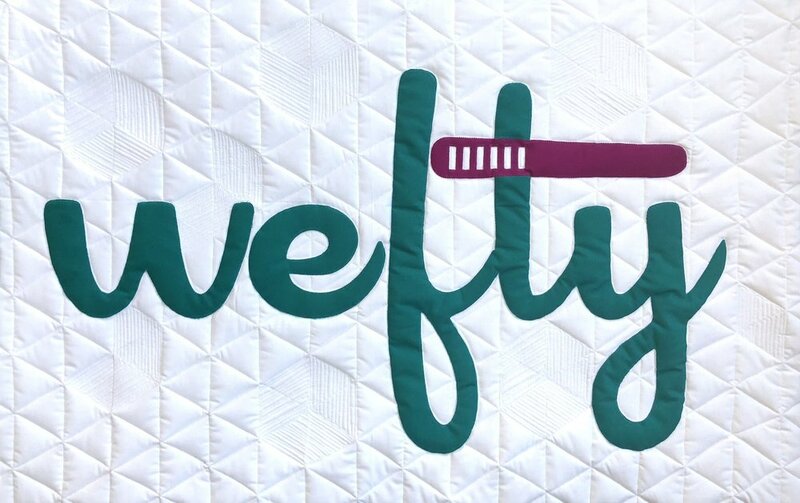 I named my business WEFTY after the horizontal fiber (weft) that is woven over and under the stationary and vertical fiber (warp) on a loom to make cloth. Also I thought the word WEFTY was hilarious. My friend Joe Williams designed my logo and since then I've become super emotionally attached to it. Whenever I design anything, like an ad or pattern cover, the first draft is always mostly just my logo great big in the center. Then my husband has to gently give me feedback, and the logo ends up in a corner getting smaller and smaller in future drafts. My logo is a source of joy and pride for me. I wanted to create a sign that allowed me to get close with, and make something out of, the WEFTY logo. I had heard of Laser Cut Quilts from some amazing work they did cutting fabric for the beautiful Fleur the Frenchie mini quilt inspired by The Tattooed Quilter. The design is the portrait of a Frenchie made by layering expertly cut Riley Blake fabrics. Laser cutting is a brilliant way to cut fabric for a couple of important reasons. First, the cutting is meticulously perfect. Home cutting devices rely on a blade to cut fabric, which allows for possible imperfections due to dulling or catching. But lasers cut reliably every time. Second, the laser fuses the edges of the fabric piece, so it always comes out clean and intact - no stray threads catching - AND (and this one is really my favorite feature) the fusing mitigates fraying along the cut edges. Laser Cut Quilts is brilliant: their prices are incredibly reasonable, they fuse the fabric to a two-sided fusible before cutting, the pieces they send you can be positioned and re-positioned where you want them, then fused to the background. After fusing, use a small zig zag or other applique stitch to permanently attach the design to the background fabric. I sent Laser Cut Quilts a JPEG of my logo and some Kona Cotton in WEFTY colors, and got my pieces back. After attaching them to Kona White, I decided to try some trapunto techniques to help the logo really pop, dimensionally as well as colorfully. When basting, I always use June Tailor Quilt Basting Spray because it's indoor-safe, odorless, and doesn't gum up my machine. Along with quilts, I use it for applique and basting interfacing to bag exteriors! My quilt sandwich was Kona white, two layers of wool batting, and my quilt top. After basting, I closely stitched an outline around the logo, and inside the letters and needle slots. I quilted a triaxial grid, which is the grid I draw on all my foam core boards before weaving. I then filled in some of the grid with quilting to look like woven tumbling blocks. True trapunto would have involved another layer of batting, and some cutting of batting after outlining the logo. I'll go full trapunto for another project I'm working on, but for this one I wanted most of the dimension to come from the quilting. The effect is subtle and fun. As you get closer to the logo quilt, there's more for the eye to see and interact with. Thanks for reading! Whatever you're currently working on, enjoy the process! Contains an affiliate link, for a product I use and am confident recommending to others.